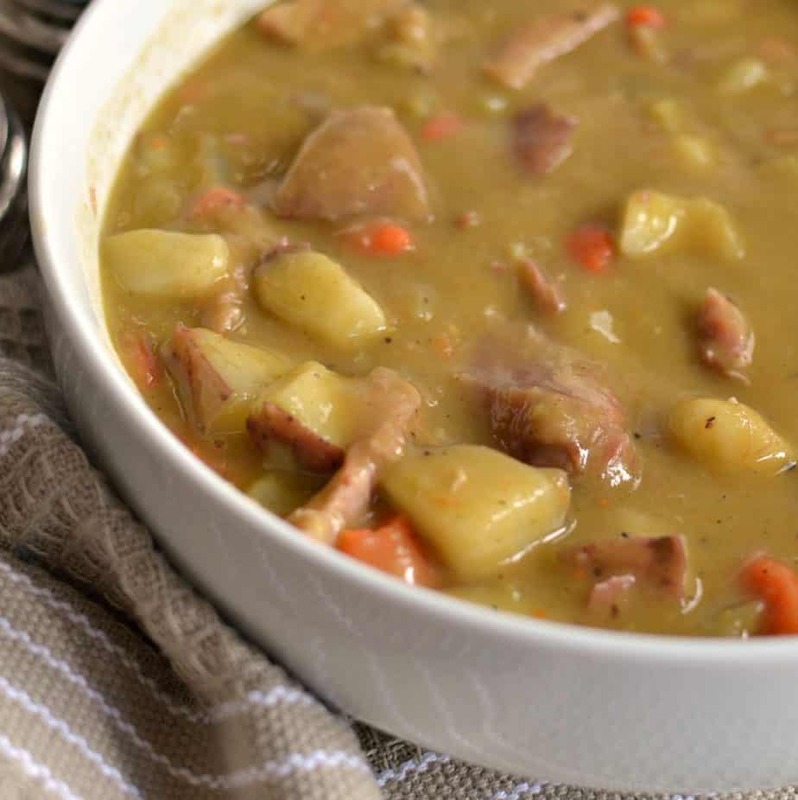 Split Pea Soup Recipe combines onions, celery, potatoes and ham into a smooth creamy split pea base that is lightly seasoned. 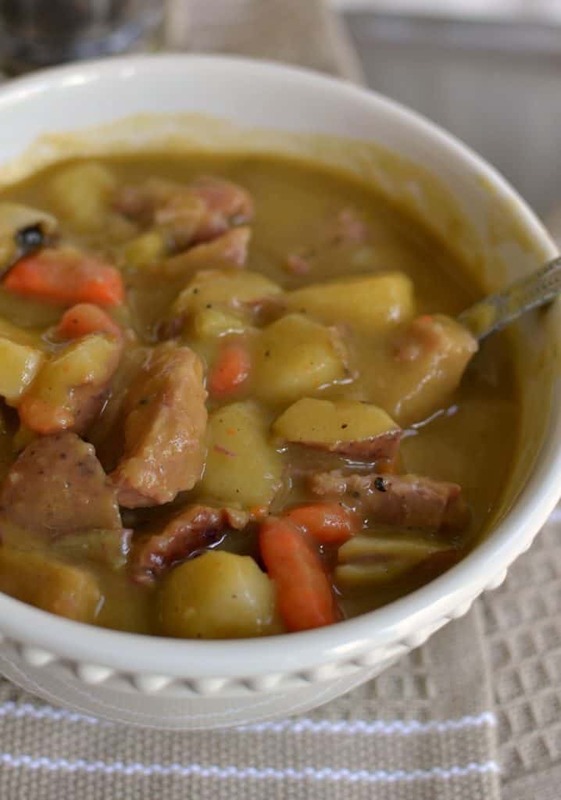 This delicious soup is best simmered with ham hocks but a ham bone will work as well. My family just loves this Split Pea Soup. Hubby just can not get enough of it! Yummy! Is there a better way to embrace fall than with a big pot of soup? Heck no! Soup just makes everyone feel all warm and cozy inside and out. We eat soup year round but for you cool weather soup eaters the cooler nights are starting to come in. This easy delectable Split Pea Soup Recipe is a cinch to make however it does require a couple of hours simmer time so the split peas and ham hocks can get tender. Do you have to soak split peas? It is true that soaking split peas shortens the cooking time however split peas cook relatively fast. In contrast simmering split peas that have not been soaked it take about 1-2 hours to cook. Soaked split peas are cooked in about 45 minutes. Split peas that have not been soaked are perfect for soup as it gives the split peas time to mingle with the other flavors. What cuts of ham are best for Split Pea Soup Recipe? Smoked ham hocks are by far the best cut. 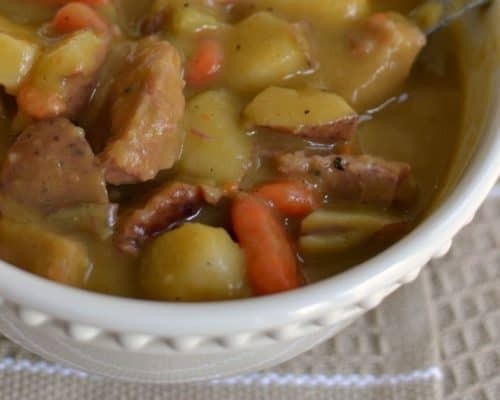 They simmer in the broth with the split peas before adding the carrots, celery and potatoes therefore they give the soup a huge kick of smokey ham flavor. However you can also attain a good smokey ham flavor with a ham bone or ham steak with a bone in it. How do you make Split Pea Soup Recipe? In a large stockpot or dutch oven over medium heat melt butter. First of all add the onion and cook until slightly softened. Add the garlic, marjoram, thyme and pepper and cook for one minute. Next add the chicken broth, split peas, ham hocks and bay leaves. Cover and simmer for 1 1/2 hours . Add the carrots, celery and potatoes and cover and simmer until the split peas, ham hocks and potatoes are tender. Remove ham hock and working with a fork pull meat from bones. Discard skin and bones and return pulled ham to pot. It is just that easy to have a delicious hearty wholesome meal that everyone can enjoy. Even my picky son loves this soup! This delicious soup is easy, delicious and dependable. Put the ingredients for this cozy meal on your list today and leave me a comment and let me know what you think. 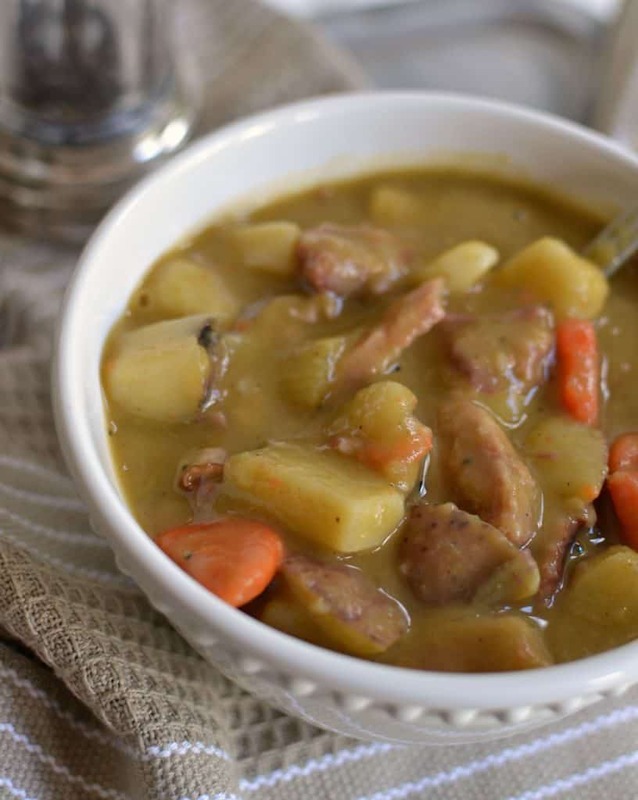 Delicious Split Pea Soup Recipe combines onions, celery, potatoes and ham into a smooth creamy split pea base that has been lightly seasoned. In a large stockpot or dutch oven over medium heat melt butter. Add the onion and cook until slightly softened; approximately 2-3 minutes. Add the garlic, marjoram, thyme and pepper; cook for one minute. Add chicken broth, split peas, ham hocks and bay leaves; cover and simmer for 1 1/2 hours. Add celery, carrots and red potatoes. Cook until the vegetables are soft. Remove bay leaves. Remove ham hocks and working with a fork pull meat from bones. Discard skin and bones; return pulled ham to pot. Warm for five minutes. How much split peas? It is not listed in the ingredients. Thank you. How much split peas? It is not included in the ingredients or instructions. The recipe looks delicious. Thanks so very much. Sorry about that. Yes I guess split pea soup would not be very good without split peas. LOL. I have corrected the recipe and it has 2 cups. Thanks for bringing this to my attention. How long does it take for the vegetables to soften? About 20 minutes depending on how large or how small you cut them. This is delicious! I added bay leaves. Not listed in the ingredients but it’s mentioned in the prep. I had no marjoram and used leftover picnic ham. Huge hit with my family and friends! Thank you! you are most welcome! So glad that everyone liked it. Thanks for the heads up on the bay leaf. I am going to correct right now! Do plain ham hocks do ok too? I didnt read the recipe as well as I should have before i went shopping. Sure ham hocks will work fine.